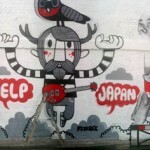 A couple of weeks ago I loaned myself to Pete Fowler to help paint this huge mural on the back of Village Underground. A nice excercise in problem solving as the OHP we were going to use to project the design wouldnt fill the wall, so Pete and I sketched his design in by eye in ever failing evening light. Thats all for now, I will update this once the timelapse video that was shot gets edited and I am able to post it. This entry was posted in Commissions, Recent Posts and tagged best ever, fowler, japan, monorex, pete, tsunami on June 6, 2011 by Bruno.